This was probably the worst stitching year since I started stitching! LOL! That is both good and bad. Bad because, well, I wanted to get more done, but good because I also did some knitting, and I did so much else that was absolutely fabulous. And like they say, you can’t do everything, a girl has to pick and choose! 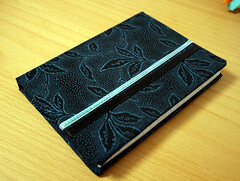 So, without further introduction, here are two lists, one for stitching and the other for knitting. I am not making any stitching or knitting resolutions for the new year. There is only one thing I am going to follow: ENJOY WHAT I AM DOING! May the year 2010 bring you and your family joy and love in every aspect of your life. Thank you for the friendship in 2009. Hello everyone. I got home on the 28th of December, late in the night, so I got my girls back home yesterday after my first day back at the office after the holiday. It was amazing to get my girls back. Even if I had a fantastic time in England with Ben and everyone, I sure missed my girls. On the 23rd of December I got a new title. I am now an auntie! My sister Gyða and her boyfriend Dominik had their first child, a son named Adrian who was almost 6 weeks early into this world and is still in the hospital. He is doing great, just a little lazy when it comes to nursing so he will be able to go home as soon as he starts drinking more. 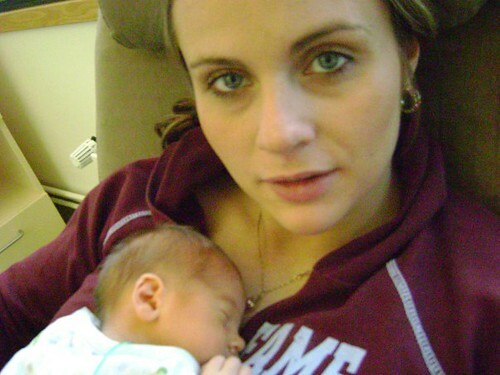 I am going to the hospital today to see him and can not wait! I did a whole lot of shopping for them while I was in England and last night I gave them a huge bag full of clothes for their little son. 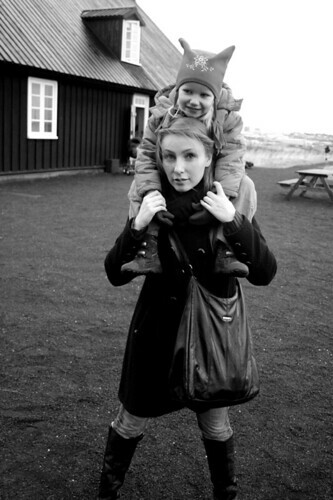 My sister Gyða and her son Adrian. Today, me and my friend Lilja took my girls to Árbæjarsafn to see the Christmas Fair. It was wonderful and something that I would like to make a new tradition with my girls. The old houses have such an amazing spirit and are so beautiful! The employees dress up in old traditional Icelandic clothes and are all so very friendly. You could try some smoked lamb, see a printer at work, a toy maker, the old Santa’s were running around. Yes, I said Santa’s. We have 13 of them. Check out the link, they are fun! Me and Karítas in Árbæjarsafn today. I took a bunch of pictures today, and you can see them all here. 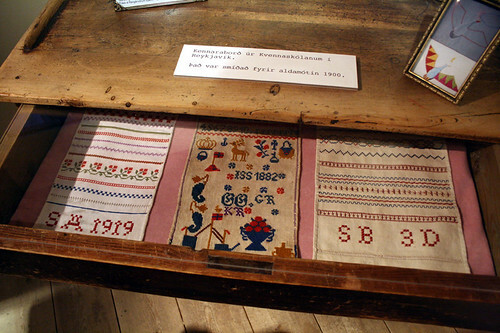 There are some amazing stitched and embroidery pieces there! I am still working on Christmas presents. 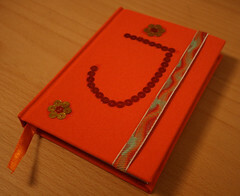 Me and my daughter made these notebooks for her friends for Christmas the other day and she is so happy about them! I am knitting, stitching and doing other crafts also. Every night is planned and used to the fullest so I am busy busy busy. I promise loads of pictures after Christmas. Only 5 days until I go to England. Stressing a bit, but I keep telling myself that it is all going to be OK. Oh, and to you rude anonymous commenters who claim I am a bad mother for not spending Christmas with my kids, I have one thing to day. Mind your own! I deleted those nasty comments and if you do not have the courage to talk to me and say your name, it is better to keep quiet. You do not know me, and have absolutely no right to judge me. To all the other sweet persons that have been faithful readers for years! Thank you! Thank you for coming back and for all the support and kindness you have shown me over the years. I hope you and your families have an amazing time over the holidays. Much love! I am stitching/knitting/crafting these days, honest! 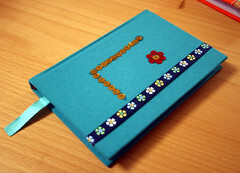 The thing is, that what I am working on are all Christmas gifts so no pictures are available at the moment! Soon though, soon. I can show you this one though. 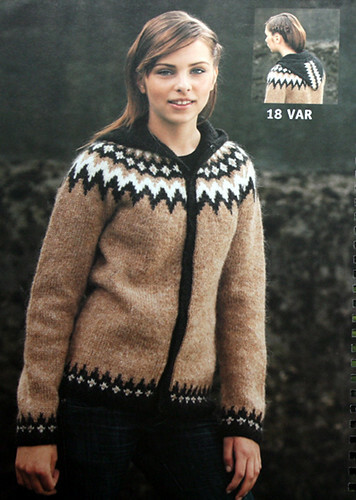 I am making this sweater out of Icelandic wool (but off course) but the colors I am using are totally different from this. I can’t wait to start the top pattern to see the colors better. Very exciting. I will be spending Christmas in England. My girls are spending Christmas at their fathers (I have them one year, they have them the other year) so I decided to do something new instead of being alone and missing them. I am still getting used to the thought to be honest, and am quite nervous about the whole thing. I know I am going to miss my girls, and my family a lot, but, I made the decision and now I am going to run with it. Eeeek! So, instead of stitching/knitting pictures, I will share this one with you. 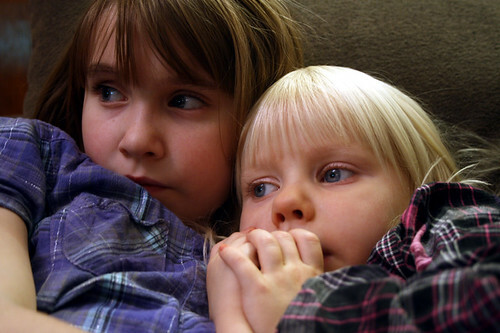 I took it to day of my girls when they were cuddling on the sofa, watching The Nightmare Before Christmas. I am so rich. So so so rich. How amazing are they. I love how this one turned out!